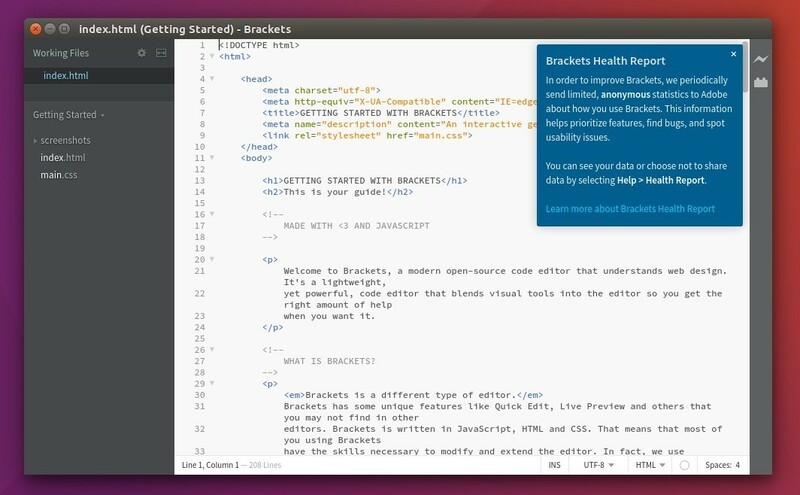 Adobe Brackets code editor 1.12 was released hours ago. Here’s how you can install it in Ubuntu desktop. And a list of bug-fixes. See release note for details. Want the latest Adobe Flash Player in Ubuntu Chromium browser? After v11.2, the Flash Player plugin for Linux will only be available via the “Pepper” API as part of the Google Chrome. Adobe will continue to provide security updates to non-Pepper distributions of Flash Player 11.2 on Linux for five years from its release. There’s a PPA contains installer packages which will download the latest Google Chrome package, extract the Pepper Flash files, and install them for Chromium (Google Chrome itself is not installed). Adobe Air for Linux is no longer supported, but you can still install the version 2.6 on Ubuntu & Linux Mint with a little tweak. If you’re running programs that are built on AIR, follow the below steps to install Adobe Air first. 1.) Press Ctrl+Alt+T to open a terminal window, I’ll do the job by running a few commands in terminal. 2.) Download Adobe Air 2.6 for Linux via wget command, it’s about 15MB. Follow the setup wizard, and done!